One of the big challenges of off grid living in a hot area is cooling – both food and yourself. It’s not just a matter of being water and energy efficient for the sake of the environment, but often due to the limitations of resources available. On my little patch of outback Australia, I was able to tackle the food cooling issues to a degree with an electricity-free Zeer pot. However, in the summer of 2008, Niki the Wonder Dog and I learned that air conditioning sometimes isn’t a luxury, but a real necessity. I usually love the heat, but when native animals adapted to living in dry, hot conditions started started dying from heat stress; even with water available to them, that’s when I realised I might be in trouble. We got through the worst days that summer using a few old techniques for keeping cool indoors, but only just and it was terribly uncomfortable at times. One day it reached 48C (118F) inside and there were many days of 40C+ (104F+). Given I only had a small mobile solar power rig (single 130 watt panel) to run my notebook 12 hours+ a day and some lighting; I didn’t have a lot of capacity to spare for power assisted cooling. Refrigerated air conditioning was definitely out of the question and even evaporative air conditioners are mostly rated at 150 watts +. I started to design a small personal evaporative air conditioner; but I’m no designer. Even in my head, it looked like something out of the Flintstones. I searched for solutions around the world off and on for months and found nothing that was compact, light on electricity and water consumption. 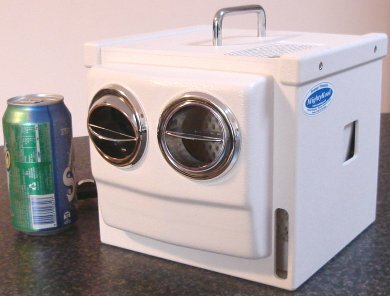 Then I came across MightyKool, a product from USA company Swampy Cooling Systems who have been making 12 volt portable cooling systems since 1989. What follows is going to sound like an ad for the MightyKool, but I assure you I paid full price for my unit. It’s just that I’ve been so impressed with the Mighty Kool as it does *exactly* what I need it to and I can see it being very useful to not only folks living off grid, but for use on camping trips as well. It’s small, but very powerful; able to crank out over 200 cubic feet of air per minute. The first thing I want to mention, and this is very important, is that this particular unit will not cool an entire room. It is designed to be a personal cooler, making the immediate area around you more comfortable, nothing else… but it does that incredibly well. Also bear in mind that this is an evaporative air conditioner, so it’s not really much use in very humid areas. The two vents can be moved to direct cool air in different directions and there’s hosing you can also add to give it more reach. This unit holds nearly two litres of water, enough for a couple of hours and you can attach a larger water bag to it for longer periods between refills. That was pretty amazing – and when temps hit 45C, I was still comfortable enough to work and not even breaking a sweat. Of course, the further away you’re sitting from the vents, the higher the temperature, but placed on a desk around 3 feet away from me, I’ve been able to continue working in all conditions – with just a single vent blowing cool air my way. The second vent I direct at Niki the Wonder Dog’s bed. Swampy Cooling Systems have a variety of models. The one pictured above is the MW1, a 12 volt model (110 volt adaptor available). At its least powerful setting, it draws just .8 amps (11.3 watts), which by air conditioner standards is nothing. It’s about the same as a small 12 volt desk fan. As mentioned, it only uses just over a litre of water an hour; so it’s great in situations where water supply is limited. The MightyKool MW1 is powered by twin brushless double ball bearing motors that should last at least 20,000 hours. I was very pleased to discover it’s even quieter than the desk fan I had previously. The MW1 is very light, just over a kilo (under 3 pounds). It’s a simple unit, but well constructed and easy to pull down and clean. The special cooling pads last around two to four hundred hours – and they are cheap to replace. The Mighty Kool isn’t cheap, but what it does, it does very, very, very well. At the time I bought it, there was nothing else on the market that came even close to what this little powerhouse could do. The other thing that impressed me about Swampy Cooling Systems was their level of customer service. I communicated mainly with Jack, the owner of the company during my original purchase and he was very attentive. Shipping it over from the USA with a few accessories was a worry as I was concerned about damage, but I think the MightyKool folks must be expert Tetris players too – I had never seen a box so well packed. Thanks to MightyKool, I no longer fear heatwaves. It’s nearly 4 years since I bought it and I’m still of the opinion this is one of the better purchases I’ve ever made. The MightyKool isn’t just a creature comfort; it can be a life-saver.